“In the digital economy, every business is a software business, and the software landscape is changing forever. The traditional Core IT approach to providing business value through lengthy plan-build-test-deploy cycles can no longer deliver value in an increasingly competitive, consumer-centric landscape. Merely compressing these cycles through adopting iterative or agile methods does not address the challenges organisations face in terms of innovation, speed to market, quality and resilience. 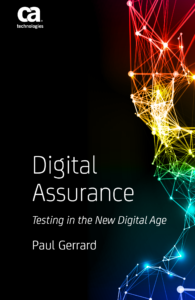 This book is aimed at testers requiring an overview of the challenge and Digital leaders and managers wanting to know how to shape the testing and assurance of their projects. If you would like a copy, you can get one for free direct from CA Technologies here. The Test Management Forum was set up in 2004 and the first meeting took place on 28 January of that year. We have run events every quarter since then, and the 53rd and latest meeting took place at the end of January. Over 2,600 people have attended the London events over the years. Although most Forum attendees come from the UK, the uktmf.com website has approaching 10,000 registered users worldwide and the LinkedIn group 11,800 members. The TMF continues to be a popular Forum with a global (and not just a UK) influence. The original aim of the Forum was to bring together more senior practitioners, to network and share knowledge. The core of the Forum meetings are discussion sessions. They are run by an expert in their field and comprise an introductory presentation of 15-30 minutes or so, followed by a facilitated discussion of the issues raised in the talk. Sessions are 75 minutes long and often stir up vigorous debate. The format and ethos of the Forum are unchanged since 2004. But over the last thirteen years, there have been many changes in the industry and in the Test Management community. I’d like to talk around some of these changes and explain why we decided to bring the TMF up to date with an industry that is far different from that in the early days of the Forum. In 2004, the Agile movement was still in the early stages. For the next ten years or so, we ran many sessions that explored the changing (sometimes disappearing) role of test managers. I recall having many conversations with people who had been ‘Agiled’ and were concerned their role and contribution to Agile projects was uncertain. The Test Managers I knew personally reacted in very different ways. Some managers and leaders became testers again, some specialised in test automation or security testing or usability. Others moved closer to their business, became business analysts or consultants. Quite a few were promoted out of testing altogether to become project managers, development leads or heads of solution delivery. Some senior managers retired from IT altogether. Agile had a big impact, but approaches such as continuous delivery, DevOps, shift- left, shift-right, shift-wherever and analytics are changing the roles of testers in fundamental ways, and I should say, usually for the better. Some testers are falling by the wayside; getting out of testing. The pressures on Test Managers continue, but new doors are opening and opportunities emerging. Some test managers become Scrum Masters, more are finding new roles which I have labelled as Test Masters and in general, these people are performing an Assurance role. Assurance (as distinct from Quality Assurance) is very much focused on delivery. The assurance role supports the delivers team by acting, at various times, as a process consultant, as a testing expert, as a reviewer, as a project-board level advisor and sometimes as an auditor. This variety of roles is more senior, more comprehensive and more influential than the traditional test manager role. The range of skills and authority required are beyond many test managers – it is not for everybody. But Assurance is a more senior role with a broader influence and is a natural advancement for aspiring test professionals. With this background, we have decided to re-brand the Test Management Forum to be the Assurance Leadership Forum (or ALF) from April 2017. The ALF has very much the same goals as the TMF, but with a broader organisational, managerial and delivery-focused remit. Test leadership and technical testing issues will figure prominently in the ALF, but the range of topic areas will increase, with an alignment to the aspirations and career progression of senior practitioners. Mike Jarred, of the Financial Conduct Authority has helped behind the scenes with the Forum for some time. Mike is also one of those managers with a testing background who has advanced beyond testing and into broader software delivery management. He is well placed to take over the Programme Management of the Forum. In December, I moved house to Macclesfield in Cheshire, making it harder for me to host and programme the London-focused Forum events. Mike offered to take the programme role and I gladly took up his offer. 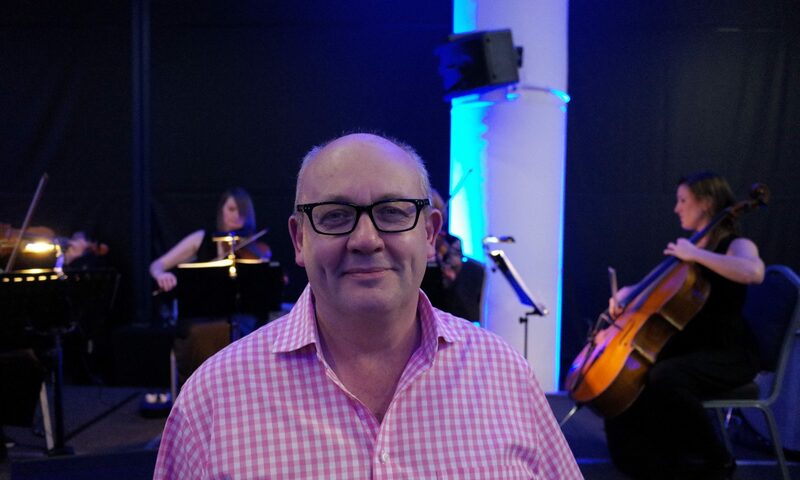 I will continue to be the ‘host’ of the Forum and of course support Mike in putting the events together. My more focused role will allow me to take a more active part in the discussions themselves, for a change! I’ll be asking for expressions of interest in setting up a Northern Forum in the Summer before too long, I’m sure. In the meantime, I hope you will support the Assurance Leadership Forum, and Mike in leading it. The existing uktmf.com domain will continue to point to the Forum website, but a new domain ukalf.com points to the same content and will be our preferred url from now on. The LinkedIn group will be also renamed shortly. Over the next few weeks, we’ll be rewriting some of the content of the website to better define the purpose of the ALF. I expect we’ll have a debate on possible directions in the next Summit. The First ALF Summit will take place on 25 April in London and if you want to contribute to the day, do let us know. Last month, I presented a webinar for the EuroSTAR conference. “New Model Testing: A New Test Process and Tool” can be seen below. To see it, you have to enter some details – this is not under my control, but the EuroSTAR conference folk. You can see the slides below. The value of documentation prepared in structured/waterfall or agile projects is often of dubious value. In structured projects, the planning documentation is prepared in a knowledge vacuum – where the requirements are not stable, and the system under test is not available. In agile projects – where time is short and other priorities exist – not much may get written down anyway. I believe the only test documentation that could be captured reliably and be trusted must be captured contemporaneously with exploration and test. The only way to do this would be using a pair tester or a bot to capture the thoughts of a tester as they express them. I’ve been working on a prototype robot that can capture the findings of the tester as they explore and test. The bot can be driven by a paired tester, but it has a speech recognition front-end so it can be used as a virtual pair. From using the bot, it is clear that a new exploration and planning metaphor is required – I suggest Surveying – and we also need a new test process. In the webinar, I describe my experiences of building and using the bot for paired testing and also propose a new test process suitable for both high integrity and agile environments. The bot – codenamed Cervaya™ – builds a model of the system as you explore and captures test ideas, risks and questions and generates structured test documentation as a by-product. If you are interested in collaborating – perhaps as a Beta Tester – I’d be delighted ot hear from you. DevOps is killing QA. Really?